Contrasting colours of lime green against deep brown are the centre of this playful fresh gourmand. 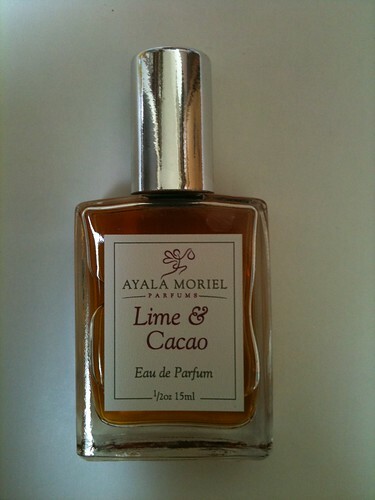 Inspired by the Mexican way of treating chocolate as a savoury treat, Lime & Cacao is more piquant than decadent, and balances the sweetness of South American balsams with zesty lime, juicy may chang, and mineral and melancholic Blue Cypress from Australia. 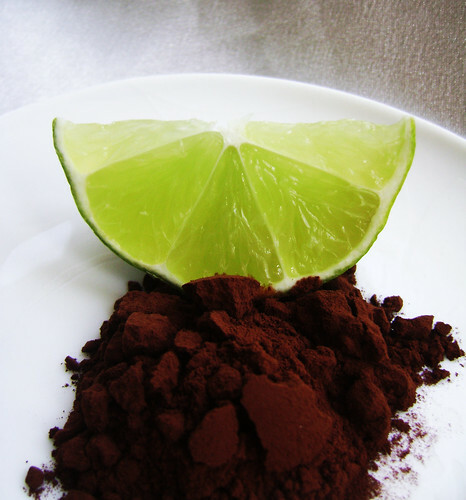 Lime & Cacao OOAK, a photo by Ayala Moriel on Flickr. This one-of-a-kind custom perfume is now available for adoption! When you purchase it, you also purchase the rights to exclusivity and I will never make it for anyone else but you. A refill can be re-ordered for $180 as the formula is kept on file. 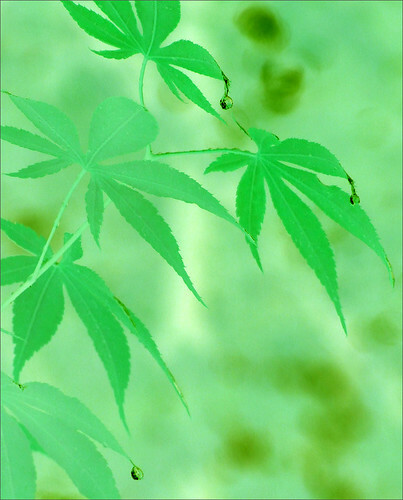 Green - DSIR0201-g, a photo by Bahman Farzad on Flickr. Some products are inspired by unique materials, and others by unique people. The idea for Grin body oil came about when I had a lot of left over Boronia absolute from the large batch I've ordered from the distiller (or should I say extractor?). But it didn't manifest until a very special customer of mine, Melinda Huntley, asked for it. And so it is now for everybody to enjoy! Grin body oil has all the goodness that my Song of Songs body oil has (squalane, avocado oil, tea seed oil, fractionated coconut oil, jojoba oil and vitamin E), but with Grin's elegant, cool, green floral scent. It has many precious absolutes: boronia, violet leaf, rose, jasmine form Egypt - which is why it is a bit more expensive than the rest - $35 for 15ml. 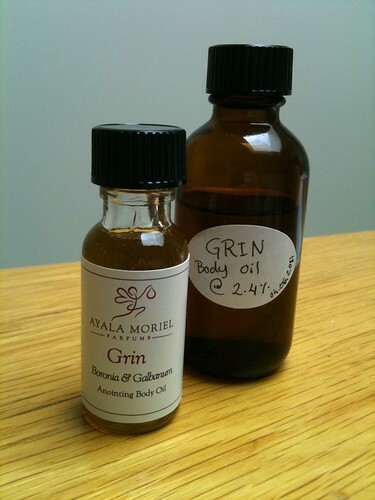 Grin Body Oil, a photo by Ayala Moriel on Flickr. P.s. The picture is of my trial batch, which was at 2.4% - a little too high, so I reduced it to 2% which I think is just perfect... Also, the Indian jasmine I used in my trial batch was a little too indolic, so I replaced it with Egyptian jasmine, which is more sheer and less indolic. SUMMER :), a photo by gege.gatt on Flickr. I'm excited about summer - it's the time of the year when I can be more productive than ever, getting ready for the busy season ahead (fall & winter 2011/2012) while also relaxing (a lot) by the beach! If only all year around could be that balanced... I'm already beginning designing new products, about which I will tell you when I get a little more time. The days just fly by trying to keep my daughter happy and the ongoing business affairs rolling more or less smoothly. But I will keep you posted about various things I've been concocting in the wee hours of the night, including a new scented body oil, and, of course - Smiling Country, which I was happily wearing all day today (and will be telling you about all the surprising notes in it after June 24th). 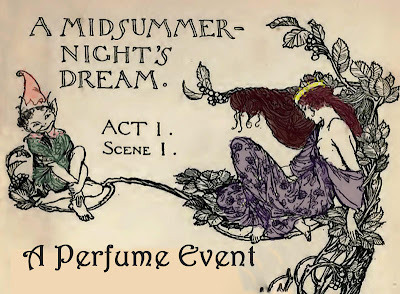 This scent-blog event was initiated by Amanda Feeley of Esscentual Alchemy. As the blog posts reviewing the participating perfumes roll in, you can find the links here. I haven't revealed the notes used for the perfume, because I wanted the bloggers to experience it for what it is, rather than break it down and dwell on the particular elements that make up the perfume. Seems like this was getting the complete opposite reaction - they each seem very eager to guess what ingredients were used, and even more anxious to find out if they were right! I'm sticking to my original plan, which is to not reveal what the notes are until everyone is done reviewing them. But since everyone seems to like some guessing - you are more than welcome to add your speculations! We got 'em, a photo by kennymatic on Flickr. 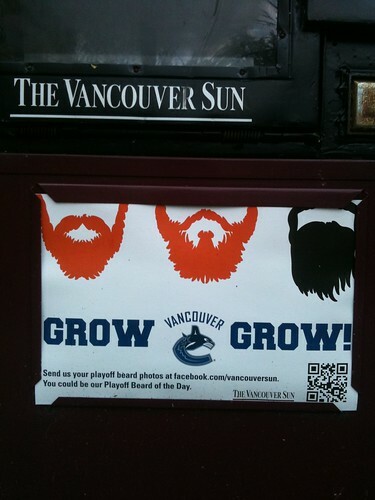 Playoff Beards, a photo by Ayala Moriel on Flickr. With the battle on the Stanley Cup dragging on all the way to the very last game 7 (could playing winter sports in June be the reason why the weather has been so cold and rainy this spring?! I wonder...). I can only hope that all of what Vancouver's downtown and West End residents had to put up with for months (countless sleepless nights; or, hmm, as many as the number of games the Vancouver Canucks won this season). The riot police forces have been on their toes since as early as 8am this morning, helicopters and all, and I'm not sure if they think that the partying will get too hard around 10am, or if they simply had to commit for a full shift. Either way, they are so far the noisiest thing in town. Judging by what's going on on the streets today, many people either don't have jobs in Vancouver, or have taken the day off. The bars are full, and the beaches are empty. And as much as I was looking forward to watching this game with my newly found hockey insights (side-effects of my dad's visiting from Montreal), a picnic on the beach on the first *really* sunny day we've had in a while is far more compelling than cramming myself into a sports bar, or hunching over my laptop to watch it on CBC. 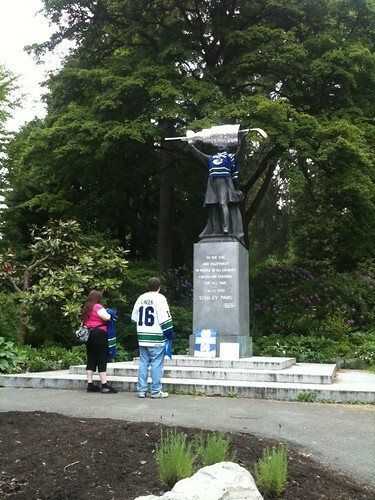 Lord Stanley Gets Ahead of Himself, a photo by Ayala Moriel on Flickr. Want the cup?! Well then, don't let Bruins into the net and try to score at least one goal! That's seems to be the magic formula on home ice. And then maybe there's going to be a bear hanging on the lego guy's fishing rod! To show my support, I'm going to watch the game till the 1st goal in the game (which must be a historic moment, either way you slice it), than head to the beach wearing my green bikini (the same Kelly green used in the Canucks logo), and a generous spray of Orcas, after the team's pet animal, mascot, former logo and what have you. Orcas, my newest creation, is ready to debut today!!! Orcas is bottled and packaged and those of you who're still unsure of what to get your dad for Father's Day next Sunday - this is a unique, yet easily lovable scent, and will make any dad who appreciate scent happy. Orcas was added to Fragrantica fragrance directory today. If you are a member of this wonderful online fragrance community, you can add your reviews and share insights about this perfume (and many others!). Lilac Structure, a photo by Ayala Moriel on Flickr. Enjoying the very last blossoms of lilacs around town for me thinking, yet again, about structure. Trying to build a lilac perfume from natural materials only is probably impossible using complex aromatics such as direct extractions and distillations (i.e. : essential oils, absolutes, etc.). If I were to use isolates, this would be a lot easier - terpineol is the main molecule that makes lilac smell like lilac, and the other notes serve as a backdrop to enrich that characteristics. According to Poucher's profiling of lilac, it only takes terpineol, plus an artificial lily and heliotrope bases a touch of rose and jasmine essences to create a true lilac scent. He uses the word "back notes" to describe the role of heliotrope and rose and lily in the fresh lilac flower scent. And this got me thinking about the lilac structure. 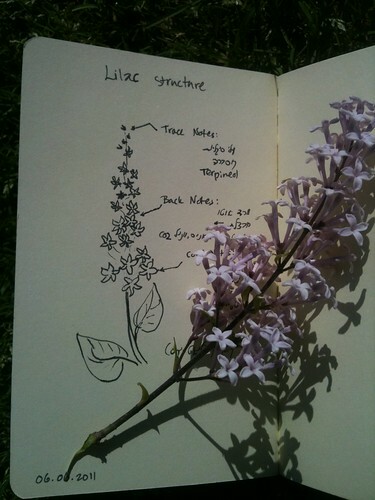 It can be illustrated like the flower itself - with the core notes, or the main ones being those that give it the character (which I drew on the very bottom part - the larger blossoms on the lilac stems), with the "back notes" - i.e. the nuances that give the lilac its richness, acting like a backdrop for the most dominant notes; and lastly - the trace notes, which are the unopened buds on the lilac stem. Do not confuse between top notes, heart notes and base notes and the trace notes, back notes and core notes. Some of the core notes can be base, some can be heart and some can be top notes. It has nothing to do with volatility, but with the olfactory structure of the perfume, of what's dominant and determines the character, and what's just an added nuance. 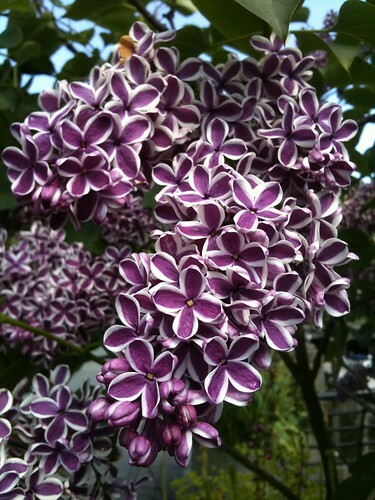 As in the case of lilac - while there are three main "floral bases" in the back notes, the heliotrope, for example, will require heliotropin (a base note) as well as some anise (a top note). It's quite abstract and conceptual to think about structure in perfumery, and visuals do help. What I find most fascinating, is how the shapes in the natural world correspond so well with the other chracteristics of the plant. It's difficult to me to describe the "shape" of the smell of lilac, but the shape flower itself makes it self-explanatory. The smell of lilac is as fluffy, delicate, airy, heady (pointing upwards like the clusters of flowers) and with some main characteristics notes backed up by olfactory nuances that play supporting roles in this lilac show. I was thrilled when Julia Prinselaar from Uclulet interviewed me for The Westerly News regarding my new fragrance, Orcas (to be launched June 12th). 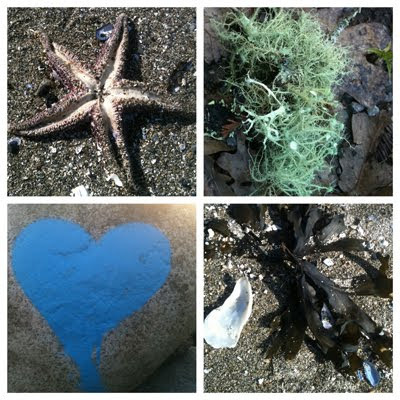 After all, it was the Wild Pacific Trail in Uclulet that inspired this perfume more than anything else! Tuberose in the Flower Shop, a photo by Ayala Moriel on Flickr. What went through my head when you picked up that corpse of a flower and carried it home, all the way from Davie Street. One thing is certain: it did not look pretty. It didn't even smell all that great (if at all). The single stem looks lonely in its vase by the window. It looks like a forgotten flower that is long overdue for a trip to the garbage can. But oh my, after the sun disappears behind the Coast Mountains and Vancouver Island and goes to visit Asia and the islands in between... This dead botanical releases an intoxicating, creamy, heady, narcotic aroma that one could never forget. I love my tuberose stems in the summer, no matter how shabby they look on the windowsill, they never disappoint come night time. 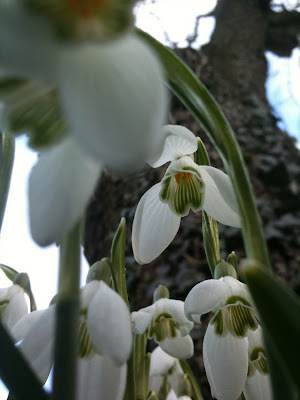 They take over the room, if not the entire house, single-stem-endly, and do it so well you'll never go back to any other way to perfuming your home at night for as long as they can be found in the flower shops! 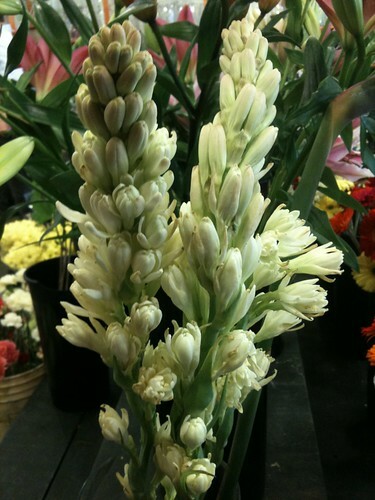 Tuberose is one of those rare flowers, that releases more scent after it's been cut from the plant. Therefore, the best way to extract it is, in fact, enfleaurage, when it will continue to exhale its beautiful olfactory aria into animal fats all night long. In India, where it is mostly grown and produced nowadays, using animal fats is prohibited for religious reasons (tallow is forbidden for the Hindu, and lard for the Muslims). The tuberose absolute we get now is a far cry from what tuberose absolute from enfleurage would smell like. Clowny Lilac, a photo by Ayala Moriel on Flickr. This spring I've been intrigued by the fresh flowers of lilacs, wisterias, heliotropes and violets and want to take on the challenge of creating them using my rather limited palette of natural raw aromatics. This afternoon, before heading to the beach (yes, again! ), I explored ways to recreate the ethereal, soft, sweet yet dewy aroma of lilacs. I've reached a certain "aha" moment with the scent strips, which translated well into an accord I blended. It actually was not great at all out of the bottle, but smelled very lilac-like on my skin early afternoon right after blending. Sadly, how things begin is not how they end - the freshly concocted batches never smell the same after maturing. And they certainly do not smell the same to my nose after coming back from the beach... What I got by than was a balsamic jasmine with green undertones. Nope. Not lilac yet. In Poucher's book, he differentiates formulating white lilac vs. purple lilac by the addition of indole to the white lilac formula. I think mine is a little indecisive, like the one in the picture - it's a little indolic, but also not. Despite the very short list of aromatics included, and the relative simplicity of some of them (natural extracts are comprised of tens if not hundreds of raw materials; but there are some where there is one ingredient that is highly dominant - i.e. : eugenol in cloves, which gives it its typical clove aroma) - it's in danger of being a soapy-balsamic mess. Pleasant, but not quite lilac-like. I say sadly, but I don't really mean it. You have to enjoy the process, frustrations and failures included, to be able to carry on a perfumer's life. Success right away is never nearly as satisfying as one that was well earned, after exploring several routes. It's sunny and warm in Vancouver (at long last!) and before I head down to Spanish Banks for my first seriously long swim of the year (hopefully!) and spend the rest of the day soaking up the late spring sun, I was determined to create a Grin scented body oil. The idea was long in the making, ever since I obtained a more substantial amount of the rare boronia absolute, which *almost* makes this luxury logical. Boronia is uber expensive, and including it in a body product is bordering on madness. The formulation was pretty much done yesterday, but I didn't make it to the blending/experimenting stage last night. I've already decided on the base oil - incorporating silky and non greasy oils such as squalane, camellia, avocado and jojoba, which I did in Song of Songs. I was contemplating using argan oil in the base, but decided against it, thinking that for a spring scent that light, the base should be light as well. Argan is fast absorbing and beautiful on the skin, but it's very emollient and rich - and not quite what I thought suitable for this scent's texture. The scent itself is a modification of Grin perfume, adopted for a skin formulation both concentration and ingredients wise. It's crisp and green, yet sweet, with jasmine, rose and boronia making up the most of the heart accord, and hints of woods, violet and galbanum round it off and add crispness as well as depth. All in all, it smells like a spring flower garden - lily of the valley, green leaves, violets and snowdrops. I have a patch of Grin body oil on my left arm, which makes my skin feel smooth to the touch and like a breath of spring to my nose. Can you see my smile?